March 20th announced the beginning of spring. As the weather improves, we encourage you to start scheduling Road Safety Audits (RSAs) in your area to identify potential safety issues and recommend countermeasures. We’ve seen a dramatic decrease in fatalities and injuries in the past year and we believe the use of RSAs will reduce those crashes even more! As always, please check out our RSA website at http://safety.fhwa.dot.gov/rsa for the latest on training and new resources and please contact us if we can assist you in any way. RSA Snapshots highlight various RSA programs across the United States. The Coalition discusses the transportation system safety in the Kansas City region; the coalition includes law enforcement, engineers, safety advocates, public health officials, citizens, trauma room nurses, transit coordinators, public works managers, emergency services providers, bike and pedestrian advocates, local officials, planners, and others. "Destination: Safe" establishes the region's transportation safety priorities, coordinates safety planning and coordinates efforts that improve transportation system safety. The strength of the coalition is found in its ability coordinate and apply the right balance of engineering, education, enforcement and emergency medical response to transportation safety issues. Members of the coalition recognize that the integration of a Road Safety Assessment (RSA) peer-to-peer program (P2P) is a critical next step in advancing this work. MARC will be soliciting proposals from communities in the bi-state Kansas City region for an RSA location. The location will be selected by November; the RSA will be conducted in Spring 2010. “In time, we hope to utilize the expertise of the coalition partners by equipping independent, interdisciplinary teams that will begin addressing our most critical safety concerns." Aaron Bartlett, Safety Program Manager, MARC. 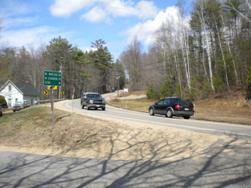 New Hampshire: The Lakes Region Planning Commission (LRPC) conducted an RSA on a 24-mile stretch of Route 28. The project is a joint effort between the LRPC and the Central New Hampshire Regional Planning Commission (CNHRPC), with LRPC acting as the lead. This project was funded through a State Planning and Research grant provided by NHDOT, with match funds from the Planning Commissions. The Planning Commissions proposed the use of the RSA methodology in support of expressed local safety concerns, to assist in the development of project priorities given the limited funding available through the Ten Year Plan, and to promote collaboration between the five corridor communities. The Safety Audit Team consisted of two appointees from each corridor community and planning commission staff supported by NHDOT and FHWA representatives. Training was provided through a two-day session led by FHWA’s Craig Allred on March 3-4 in Manchester, NH. The audits were conducted on April 26-28, with technical assistance provided by FHWA’s Rosemarie Anderson, Transportation Specialist in the Office of Safety. The LRPC also used the FHWA Peer-to-Peer (P2P) Program (http://safety.fhwa.dot.gov/rsa/resources/p2p/brochure/) to assist with this RSA. LRPC provided a picture (above) and an aerial view (left) of one of the more challenging intersections in the study area. The picture was taken looking north from the intersection of Yield Road and NH Route 28. Grades in the area and intersections on the curve of Route 28 represent the greatest obstacle. The project team is in the process of hiring a consulting engineer to round out safety audit team recommendations and to develop preliminary conceptual designs for safety improvements. West Virginia: The West Virginia Department of Transportation (WVDOT) includes RSAs as part of their design directives for resurfacing, restoration, and rehabilitation (RRR) projects. Safety enhancements are considered for RRR projects, including Interstate projects. RSAs are one tool used to determine appropriate safety enhancements, specifically on freeway RRR projects. The decision to conduct an RSA is made by the Traffic Engineering Division, in conjunction with the District Traffic Engineer for the District in which the project is located. To submit your program for RSA Snapshots, please email heather.rigdon.ctr@dot.gov or Heather.M.Rigdon@saic.com. The RSA Toolkit (CD compendium of RSA materials) was finalized. The Tribal RSA Case Studies were posted online at the FHWA RSA website. The RSA Forum was scheduled for September 2009 in Florida. The FHWA has been conducting Pedestrian RSAs in conjunction with State and local agencies. The RSA Program needs your ideas! Please contact the RSA Program Manager, Becky Crowe, at Rebecca.Crowe@dot.gov if you have an idea for a new or revised RSA resource that would be helpful to your agency. Any and all ideas are welcome! Since October 2008, the Office of Safety in conjunction with Highways for Life has been compiling a comprehensive collection of Road Safety Audit (RSA) brochures, videos, guidelines, sample reports, and case studies in soft copy format. That collection has been turned into an interactive DVD: the RSA Toolkit (Figure 1). Figure 1. Snapshot of the RSA Toolkit main menu. This is the first time that the many and assorted materials created under the RSA program have been housed in a portable, electronic format. The Toolkit’s sections include the RSA videos, guidelines, case studies, program contacts, sample reports, and program web links, as well as information about both the RSA training and the RSA Peer-to-Peer Program (Figure 2). Users simply click on the different section headings to access the materials or to navigate to the main screen; the RSA Toolkit is very user-friendly, even with the volume of materials contained within it. Figure 2. Snapshot of the RSA Toolkit Peer-to-Peer page. The FHWA Office of Safety and FHWA Office of Federal Lands commissioned a series of four tribal Road Safety Audits (RSAs) to demonstrate the usefulness and effectiveness of RSAs for tribal road agencies. The FHWA Office of Safety is planning an RSA Forum and Road Safety Audits for Local Governments Workshop for September 21-23, 2009, in Orlando, Florida. The RSA Forum will be hosted by the Florida T2 Center and the Florida Department of Transportation. The RSA Forum will focus on common emphasis areas shared between States including current progress, success stories, and ways to advance the implementation of RSAs. The Forum will also serve as a peer exchange to facilitate discussion about RSAs. Speakers from across the country will be joining the Forum to share details about their RSA programs and experiences. The optional workshop is designed to introduce participants to RSAs as an effective tool to reduce injuries and fatalities on your road network. The workshop will help local road agency professionals understand basic road safety audit concepts, risk and safety, and common issues. Details will be posted to the FHWA RSA website once they become available. Stay tuned! In response to the 2005 increase in pedestrian fatalities, the FHWA Office of Safety developed Pedestrian Road Safety Audit Guidelines and Prompt Lists for State and local governments. The purpose of these guidelines is to provide a multi-disciplinary team approach to solving pedestrian safety issues within a roadway corridor or intersection environment. FHWA recently partnered with the North Carolina DOT and New Mexico DOT to train over 50 State and local representatives on the new Pedestrian Road Safety Audit (RSA) Guidelines. The NCDOT training in Raleigh brought together states from the East and participants were led through an actual Pedestrian RSA on Hillsborough Avenue on the North Carolina State University campus. This street was an excellent training ground as participants used the new guidelines and prompt lists to focus on pedestrian safety issues. The second training was held in Santa Fe on Cerrillos Road, which is a primary arterial serving the city. The multidisciplinary team identified many countermeasures that will improve pedestrian and bicycle travel in and through this busy government and commercial center. These training courses provided Focus States with the tools to conduct Pedestrian RSA training in their states. The FHWA Resource Center will also be assisting the Focus States in using and applying these Pedestrian RSA Guidelines and Prompt lists. This will ensure that the Focus States can successfully use this tool to reduce pedestrian crashes and fatalities. These Guidelines are available for review and download at the FHWA Office of Safety Website, http://safety.fhwa.dot.gov/ped_bike/.